Jack in the Box has introduced a new value-priced combo meal they're calling "The Big Deal." 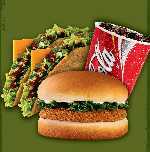 The meal includes a chicken sandwich, two beef tacos and a 20-ounce beverage for $2.59. This is an addition to Jack's existing value menu. Jack is promoting this combo as a "response to rising gas prices," because "penny pinching has become a necessity for many Americans."